1. A power/collection unit, usually installed in a garage or storage space. 2.PVC tubing, installed inside walls and/or under floors, connecting the power unit to the inlet valves. 3. Inlet valves strategically located throughout the building. 4. Vacuum hose and attachments. The lightweight hose, usually 30 or 35 feet long, connects to an inlet valve and various vacuuming attachments to provide far reaching cleaning. Three inlets can easily cover an entire 2,200 square foot home and garage. Its powerful motor and large air flow allow the central vacuum to pick up deep-down dirt, dust and debris, even microscopic particles like pollen, mould spores and dust mites. No heavy equipment to haul around or maneuver around furniture and up the stairs. No cords caught on table legs. The lightweight crush-proof hose and attachments are all you’ll need. Conveniently placed inlets allow quick and convenient cleaning of the entire house. By effectively removing dust mites, pollen, mold spores, pet dander and other allergens from the indoor environment, the central vacuum can help relieve allergy sufferer’s symptoms. A central vacuum adds value to a home and can increase resale by as much as $1500 or more. Like other built-in appliances, it is an excellent selling feature. If you are interested in having a central vacuum installed in your home, please give us a call at (403) 362 3819 or leave us a message with your detailed information to set up an appointment for your installation needs. More Reasons to Have a Central Vacuum System Installed in Your Home? Note:The amount of outlets in use at one time with most installs will be one. The best thing about central vacuum systems is that they don’t require you to carry a heavy unit from room to room or up and down the stairs. 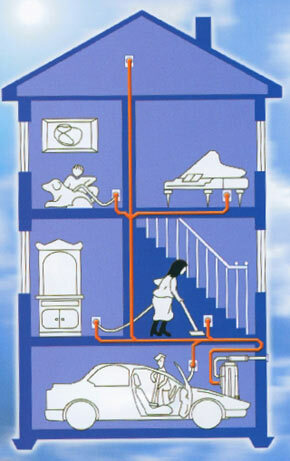 Central vacuum systems are designed to remove all the dirt and debris from your house and send it through tubing located in the walls to a receptacle in an out-of-the-way location like a garage or basement. With central vacuums, you only carry a lightweight hose and power brush unit around the house. The power unit is permanent and out of the way. With a central vacuum system installed in your home, we will place inlets around your home at convenient locations. Instead of plugging a portable vacuum into existing electrical outlets and hoping the cord reaches around your home, you can move the central vacuum hose from inlet to inlet. Where you put the inlets is up to you. We can even install an automatic dustpan that lets you quickly sweep debris into a wall vent using a regular broom. The most noticeable benefit of a central vac system is the significant reduction in airborne allergens. When a traditional vacuum runs, it releases a lot of dust and other allergens back into the air. Because the hose is made of durable PVC plastic and fastened securely to the inlet, the dust and dirt are contained in the tubing and collection unit. A central vac has about five times the suction of a traditional vacuum, producing a much more efficient dry extraction of soils. The canister opt on a central vac system requires emptying only two or three times a year, and bags are optional in many units. Minimal maintenance is required as a result. The cost can be considered a long-term investment, the average lifetime of the unit is 10-20years. Installation in homes average about $1,500-$3500. Most manufacturers offer 5- 10-year warranties – if you buy a $200- $500 regular vac every four years, you’ll come out ahead. A central vac system adds to your home’s resale value. 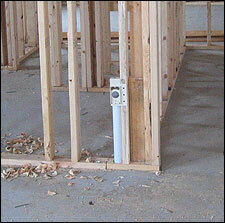 Central vacuum systems can be installed in most homes, whether finished or in construction. Central vacuum systems are also a great solution for air quality control when installed in commercial office buildings, schools, or even restaurants. The cost of installing a central vacuum system will depend on several things. The major factor in the cost will be if your house is a finished construction. Finished construction, or retro-fits are usually more expensive than when the home is being constructed as access to areas outlets are needed will be limited at best. that your site is outranked by many other websites in google’s search results.